In a previous ghost story I talked about another time I was terrified of the paranormal. I’ve been scared plenty of times before, but only truly terrified twice. This particular time I didn’t talk about it for almost ten years. I had gone to spend the weekend with my brother, Brian, and his wife, Debbie. They lived on a farm in a rural area of Ohio. I arrived at their farmhouse one Friday afternoon. It was during the spring months, warm, somewhat muggy. The evenings were cooler than the days. As always, I had a distinct feeling when I arrived that something was off balance. I knew it was coming from the wooded area behind their house though. I had always felt uneasy walking through them, especially alone. I was so uncomfortable in the woods that I quit walking the hiking trail around the pond on my last few visits there. After their kids had gone to bed, Debbie and I had decided to go for a walk through the cornfield to the old quarry on the other side. Since the moon was lit up like a night light in the night sky, it would light our way. “We’d smell them before we saw them,” she said with the confidence of an expert on deceased animals. I had no reason to doubt her. Of all the things Debbie could have been and should have been in life was a veterinarian. She’s always had a special touch with animals. They just took to her so well like a duck does with water. About five feet later, I almost stepped on a large black dog: a German Shepherd breed. I stopped in my tracks and screamed. While I was screaming, I remember wondering why Debbie didn’t see it first. After all, she was only two or three steps ahead of me leading the way to the quarry. During my moment of “scared-shitless-ness,” I had stepped backward a step or two away from the dog. “There’s a dead dog,” I cried. She grabbed my hand and we continued toward the quarry. We made it the rest of the way uneventfully. We walked along the quarry and then headed back through the cornfield to the farmhouse, me a little more hesitantly than she. By the time we got inside the house, we were laughing about the dead dog incident. However, to this very day, I am adamant there was a dead dog in our path just freshly slaughtered. Once Debbie had gone on to bed, I made my bed on the couch. I wanted to watch a little TV before it went off the air, hoping to fall asleep before then. Back in those days, we didn’t have television 24 hours a day. It went off around 12-1:00 in the morning. Almost immediately, I had very strong feelings of being terribly uncomfortable. I had the distinct impression I was not alone in the room. I sat up two or three times expecting to see one of the kids or maybe my brother or sister-in-law but no one was ever there. When the TV went off air, I was still so uncomfortable I went in to lay down on the floor in the kid‘s room. They all preferred to sleep in one room. Jeremi was maybe eight, Jackie six, and the youngest, Jason, was about four years old. Again, the feeling or presence followed me. I got up and went into the spare room, which was actually Jackie’s bedroom. I closed the door and laid down on the bed that was pushed up against the window. The light from the moon was shining brightly. I tucked my hand under my head kind of to tilt myself so the moonlight was not directly in my eyes. Within seconds of pulling the covers up over me I knew, without a doubt, I was not alone in the room. There was no question about it this time. I tried to turn over to see which one of the kids had snuck in behind me when I realized I couldn’t move. I was literally paralyzed. I looked at my watch that was backward on my wrist; it was 1:15 AM. I struggled and struggled to turn my head, just my head. I wanted to see who was in the room with me. I remember the time was close to 1:25 by the time I was able to turn just enough to see that five feet away from me, in the moonlit room, a dark hooded figure. It wasn’t a ghost either. There was no face, just a cloaked figure. When the thing realized I was looking at it, it took a step closer to me. That was all it took for me. I closed my eyes and prayed. “Please God, protect me from this entity.” I prayed silently. As I finished my prayer, I felt my body release. It was unlocked from the paralysis and I was able to move. I opened my eyes and the figure was gone. Needless to say I grabbed the blankets and went back out to the couch. I slept with the TV on, snowy channel and all and, very restlessly I might add. That was my final trip to the farmhouse. For years, I thought I had brought it into the house with me but from where? Was it the cornfield, the quarry or the woods? I didn’t talk about it with anyone because I was so frightened. I silently thought I really had brought it back with me from the woods behind their house. Since this thing was obviously of the paranormal, I’m sure that while I could feel it, it could feel me whenever I was close by. I know the entity and I certainly felt each other’s presence whenever I entered the hiking trail. The only reason I did eventually speak of it was because while at work one night I overheard my CNA’s talking about “the hag.” It sounded almost identical to my own experience so I shared with them what had happened to me. 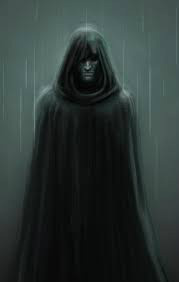 They spoke of an old crone, I was speaking of a hooded figure. The similarites was the fear-paralysis. Knowing that this entity was not a ghostly experience, it gave me relief to know I was not the only one who had such frightening experiences with entities outside of the spirit world. To make the connection between the dog and the entity, here’s some food for thought: we pray silently so that only God can hear us. Although he’s a good guesser, Satan cannot hear our prayers and know our conversations with God. I had voiced my fear openly. I was heard by, I believe, the entity (I didn’t want to step on a dead animal), and what I feared happened to me. Or did it?